Successfully Added Conquest S6 Rugged IP68 Phone - 5 Inch 720p Display, Android 4.4 OS, MTK8732 Quad Core 1.5GHz CPU, Wireless Charging (Yellow) to your Shopping Cart. 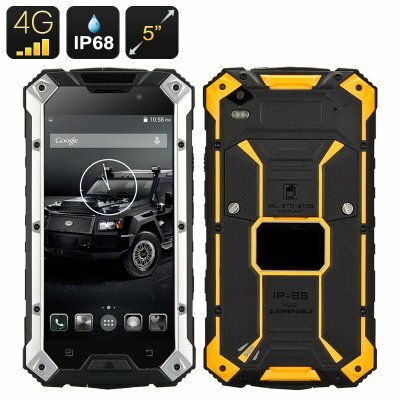 The Conquest S6 Rugged IP68 Phone boasts 4G connectivity while having a 5 Inch 720p Display, a Quad Core CPU, an Android 4.4 operating system and is capable of Wireless Charging. The Conquest S6 is a stylish rugged smartphone, which will definitely change your image about such devices. In addition to the incredible design, the model can offer an impressive capacity, bright display, fantastic camera and of course an IP68 waterproof and dust proof rating. This makes the device completely water as well as dust proof, and allows it’s functioning for quite a long time in depths of more than one meter. This means that Conquest S6 is prepared for any hardships and trials. The smartphone is equipped with bright and convenient HD 5 inch display and 720p resolution; therefore image quality is very high and allows using the device comfortably. There are enough characteristics for the device to perform all the tasks set before it due to having a MTK8732 quad core processor. When it comes to recharging this brute of a phone, you can use the included wireless charging pad for ease and convenience as you won’t need to plug in a cable directly into this rugged phone. The Conquest S6 has in its arsenal one of the most fascinating cameras among the rugged smartphone industry, an 8 megapixels that allows you to always capture every memorable moment. This rugged Android 4.4 smartphone not only supports 2G and 3G bandwidths, but also 4G FDD-LTE, which makes it the most modern rugged smartphone available today. With all these features, you can see why this rugged smartphone is a success. It combines everything you ever need in a smartphone and more. This is the Conquest S6 and it has arrived.